Footprints In the Sand Poem. 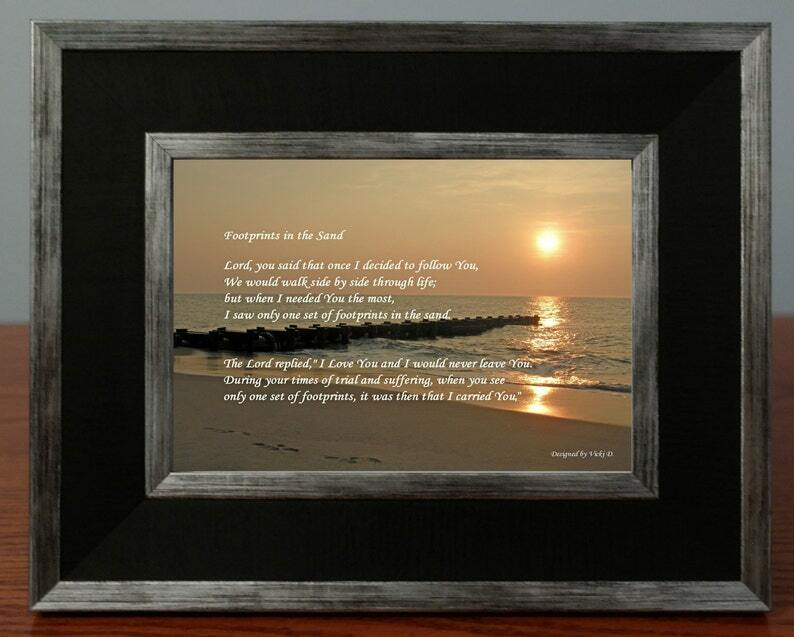 A Framed photo gift of a "Beautiful Sunrise" taken at Dewey Beach, DE. Popular religious poem. Photograph was taken by Vicki D.
This poem reads; Lord you said that once I decided to follow you, we would walk side by side through life, but when I needed you the most I saw only one set of footprints in the sand. The Lord replied, I love you and I would never leave you. Sizes: 5 x 7 & 8 x 10 with various frame options available. When ordering please note that if there is not a size noted in the frame selection, the size is 5 x 7. Our 8 x 10 sizes come in Black and Silver Frame style, Standard White Frame and the Standard Black Frame only and this is indicated in the selection drop down. Our framed photo gifts are made using high quality picture frames that can stand alone or be hung and high quality prints. Different frame colors and styles are available. Our Silver Brushed Frame and Black and Silver Frame have velvet backings. All of our frames have the hardware attached to be hung. Regarding our turnaround time: All customized gift orders will be received and processed Monday – Thursday. All orders received from Friday – Sunday will be received and processed on Monday. These are designed for you and it usually takes 2 - 3 business days to completely create a gift and ship it out on your behalf. We are happy to add a hand written note to accompany your gift. Simply, let us know what you wish to say.